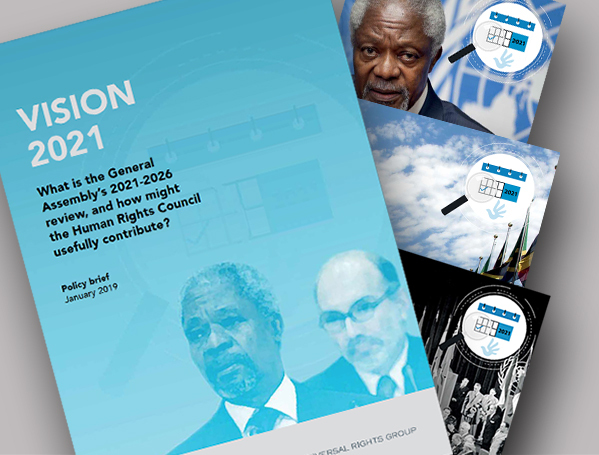 Report Launch – Vision 2021: What is the General Assembly’s 2021-2026 review, and how might the Human Rights Council usefully contribute? Between 2021 and 2026, the General Assembly is scheduled to consider the question of the status of the Human Rights Council, i.e. whether it should remain a subsidiary body or become a main body of the United Nations. This report, developed by the Universal Rights Group as part of a project supported by the Federal Department of Foreign Affairs of Switzerland, provides background information on the 2021-2026 review as well as thoughts on how the Council, as the UN’s key political body responsible for the promotion and protection of human rights, might contribute to that review. In particular, the document considers the possible benefits of a process of reflection or self-assessment (i.e. of the degree to which the Council is fulfilling its mandate as set down in GA resolution 60/251), as a key contribution to the GA’s deliberations. The document furthermore offers ideas on ways to shape a possible process of reflection or self-assessment, as well as on key questions that might be covered.